Just a shame the silly rules ministry was lurking like a bad monty python sketch. Honestly believe that you chaps are the best option for these boats as you have the enthusiasm of us amateurs, just with more storage, materials & skill. Got the chaps number so let him know i can put a "last chance saloon" offer if its the chainsaw otherwise. Shame, but there will always be another project. Thank you for trying guys. As you know, David E-P and myself started the ball rolling with a view to get 245 from Southampton to Lowestoft. Due to overwidth problems however, this was not possible, despite examining every possibility available to us. David and I would like to close the book on our part in this project, and say thank you to all who have been so kind as to offer pledges. These pledges will now be considered withdrawn, and we thank you once again for your support. 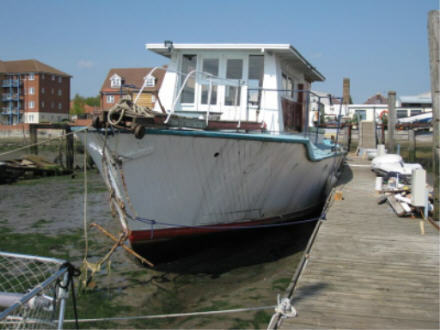 The owner of 245, Ian, advises that the boat will move from his berth this Sunday, to a berth further down the Itchen. The new owner is, apparently, going to replace the on deck structure with a more MTB style superstructure, and continue to use the boat as a house boat. We will endeavour to update you on 245 as time and effort permit. Well done in your stirling efforts so far gents!! So long as 245 has a good home & a future then pass mine & a lot of others best wishes to her new owner. If they cant cope then my number is easily found. Find myself in need of a getaway right now but only did the basic sums today & could have been tragic if they were wrong. Only need as something i can escape to a couple of days a week & buy a warboat a few more years. First choice would have to be a whaleback, or a dog if there was more than half of one left. A vosper would be nice though as her hull could be restored with a few volunteers. I'm not quite sure what the current situation is with '245' (as of 14.07.09! ), but I have been following the saga! I was contacted recently by a lady from Barcelona, who is the daughter of the original owner after WW2 and is VERY interested in '245' and her history. 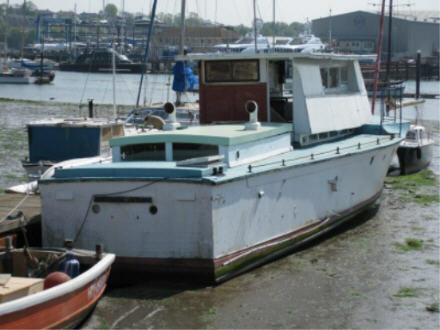 She was a very young girl when she lived on '245' and is trying to put the story of the boat in context and is very keen to contact the current owner(s). I am endeavouring today to go down to the boat and contact the owner and give him/her all the information I have. The lady in question also lived on 'MASB 26' in 1948 on the mooring where 'Sungo' and 'Mahaba' are now and has some photos there! Anyone know what happened to MASB 26? MTB 245 has won some 'gongs' when in service (as did MASB 26) and it would be wonderful to preserve such a fine boat with such history! What a shame she couldn't be moved to Norfolk for restoration! Hey Ho, that's life!! Many thanks the above, here is the best place to start any enquiry for sure, hope the new owner of 245 will take care of her, a lot of interest in doing something for her at the start of the year, albeit problems came up re transport. Anyone got an update on this old girl? If she's heading down 458's & 145's path then give her owner my number while she's viable. Hopefully she's safe & well in the care of a capable & understanding owner!?? Cudos to the succesful warboat projects but with hindsight we'd have a seaworthy dogboat & a Coastal forces memorial flotilla. With our ever brave navy struggling to keep up to date & world class it falls to us professional civilians & amatuers to help keep the history alive.